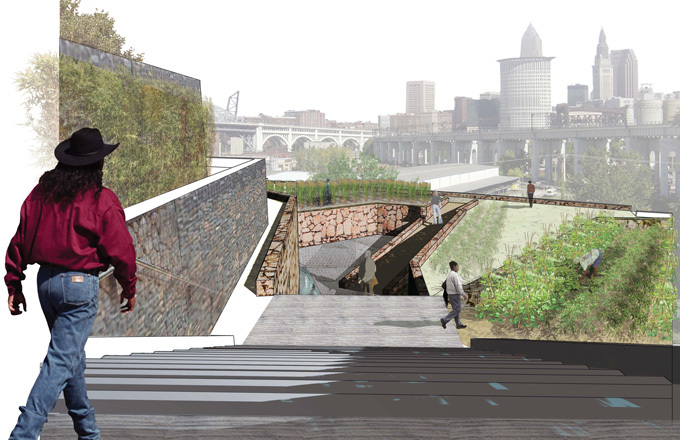 In 2007, the Cleveland Design Competition: Irishtown Bend challenged entrants to present nationally prominent, architecturally significant design solutions for an under-utilized riverbed hillside and bluff along the western edge of Cleveland's Industrial Flats. Partner, Greenberg Consultants; Toronto, Canada Architect and Urban Designer Ken Greenberg has played a leading role on a broad range of assignments in highly diverse urban settings in North America, and Europe. Much of his work focuses on the rejuvenation of downtowns, waterfronts, neighborhoods, and campus master planning. 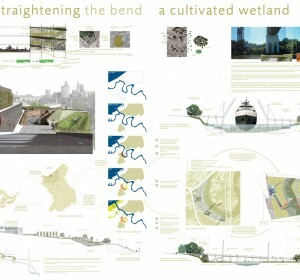 His projects include the award-winning Saint Paul on the Mississippi Development Framework, the Brooklyn Bridge Park on the East River in New York, the East River waterfront in Lower Manhattan, the Fan Pier in Boston, the Southwest and Southeast Waterfronts in Washington, D.C., the Vision Plan for the District of Columbia and the preparation of a Master Plan for the NoMA District (North of Massachusetts Avenue) in Washington D.C., Kendall Square and NorthPoint Master Plans in Cambridge, the Downtown Hartford Economic and Urban Design Action Strategy, the preparation of a Strategic Framework for Midtown Detroit surrounding the Detroit Medical Center and Wayne State University, the implementation of the Harbourfront Master Plan and Plans for the new FilmPort (Toronto Film Studios complex) on the Toronto Waterfront and an interim role as Chief Planner at the BRA (Boston Redevelopment Authority) for the City of Boston including oversight of the Crossroads Initiative which builds on the ‘Big Dig’ and the Rose Kennedy Greenway. In each city, with each project, his strategic, consensus-building approach has led to coordinated planning and a renewed focus on urban design. 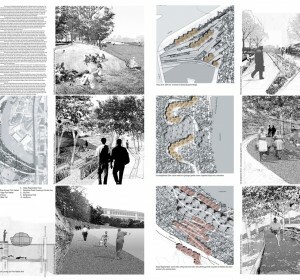 Current efforts include implementing the Master Plan for the renewal of Regent Park, a major public housing project in Toronto, plans for the new Don River Park in Toronto, a Master Plan for the Grand Parade in Halifax, integrated strategies for transit-oriented redevelopment along the proposed new north/south LRT line in Ottawa, the preparation of the San Juan Waterfront Master Plan in San Juan, P.R., the preparation of a Master Plan for the former Rockcliffe Military Base in Ottawa, the preparation of the 2010 Vision and Strategic Framework for Hartford, and a Strategic Master Plan for Boston University. Neville Bryan Curator of Architecture at The Art Institute of Chicago; Chicago, Illinois Zoe Ryan is a British curator and writer. She is currently the Neville Bryan Curator of Design at The Art Institute of Chicago, where, in addition to organizing exhibitions, she is building the museum’s first collection of contemporary design. Prior to moving to Chicago she was Senior Curator at the Van Alen Institute in New York, a non-profit public art and architecture organization committed to improving the design of the public realm. Ryan was also editor of the Van Alen Report, the Institute’s quarterly journal. She joined the Institute in Fall 2000 to lead research, publication, and exhibition projects. Ryan most recently organized the exhibition “The Good Life: New Public Spaces for Recreation,” which opened in September 2006 and explored how public spaces are being redesigned to meet the needs of 21st century recreation and leisure. She edited the accompanying catalogue, distributed by Princeton Architectural Press (PAP). Ryan co-edited Coney Island: Pavilions of Fun, published in spring 2007, by PAP. In 2004, she curated “VARIABLE CITY: Fox Square” (September 28-December 10, 2004), an exhibition of work by visual artist Julia Mandle and Ariel Krasnow, an urban designer, which explored the unique hybrid of outdoor site-specific performance and urban design research. In 2003 she curated “OPEN: new designs for public space” (June 11-October 31, 2003), an exhibition exploring innovative architecture, landscape, and urban design from cities across the globe, by renowned designers including Will Alsop, Elizabeth Diller and Ricardo Scofidio, Craig Dykers, Peter Eisenman, Zaha Hadid, Walter Hood, and Marion Weiss and Michael Manfredi. The show traveled to the National Building Museum in January 2005 and the Chicago Architecture Foundation in January 2006. In November 2006 it was shown as part of the Quito Biennial in Ecuador. In summer 2007 it will open at the Cleveland Museum of Contemporary Art. In fall 2001 Ryan co-curated the exhibit “Renewing, Rebuilding, Remembering” (February 12 – July 9, 2002), which traveled to The Lighthouse, Glasgow. Ryan coedited the accompanying publication Information Exchange: How Cities Renew, Rebuild and Remember, published in November 2002 with Distributed Art Publishers. The Institute projects she has managed include the October 2005 conference “The Politics of Design Competitions” organized with Princeton Unversity and the April 2002 conference “Urban Design: Practices, Pedagogies, and Premises,” organized with Columbia and Harvard Universities. Prior to working at VAI Ryan was a curatorial assistant in the Architecture and Design Department of the Museum of Modern Art, New York and worked on “Projects 66: Campagna/Ingo Maurer” (November 27, 1998 - January 19, 1999). Before that she worked in the Department of Prints, Drawings and Paintings at The Victoria & Albert Museum on the exhibition “The Power of the Poster” (April 2 - July 26, 1998). Ryan has a Master’s degree in Art History from Hunter College, New York and a Bachelor’s degree in Art History from the University of Sussex. She is a member of the New Leadership Associates of ArtTable. She is often called upon as a juror and has been asked to speak at numerous conferences and panels globally. Her writing on art and design has been published internationally in The Architect’s Newspaper, Blueprint, Contemporary, Monument, Icon, and Log. Senior Associate/Studio Leader, Rockwell Group; New York, NY Mark Robbins is the dean of the School of Architecture at Syracuse University. His work bridges the fields of art and architecture, exploring the complex social and political forces that contribute to the built environment. 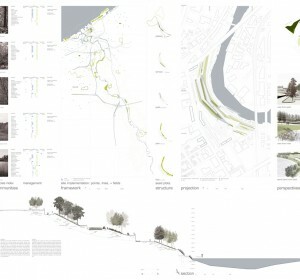 Before coming to Syracuse in the summer of 2004, Robbins was the Director of Design at the National Endowment for the Arts in Washington DC where he developed an aggressive program to strengthen the presence of innovative design in the public realm. *The Jury member descriptions were written at the time of the competition, and have not been kept up to date since the particular competition for which that person was selected as a jury member.